Hi Digital gurus, I and my colleague are working in customizing the Fiori applications which has less barring on some of the hybrid tools like Cordova. Now days we see lot of Fiori Applications on mobile using Cordova. Even to accomplish small tasks, engineer ends up making it hybrid, this calls for additional efforts and extended timelines (either in writing a new Cordova container or re-branding the SAP’s Fiori client container). Normally customer comes with different choices and priority, but when we talk to them in terms of Hybrid route; they raise certain exception both in terms of App lifecycle management and distribution. Having taken stock of the current situation, I and my colleague have started to explore various routes which are falling in line with Browser way of working. Definitely this article is not to compare between two technologies, against their pros and cons, however what we would like to express is that, there are certain other alternates that can be thought through before we make a decision on packaging. Before we do deep dive into this topic we would like to share information about the browsers and it’s compatibility with respect to some of the key areas like (Camera, Location, Barcode Reading, Voice based input service, talkback service, Explicit notification management & interaction with other USB devices for example (fingerprint sensor). For this article we are handpicking only browsers which are frequently used, please refer below table for more information. It is now clear that browser too has got lot of capabilities. Let us quickly see some of the challenges that we encounter in Cordova application container. 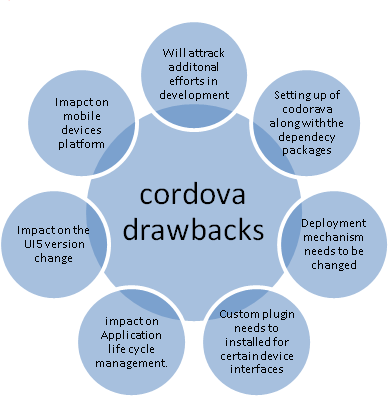 Below diagram shows us some of the headwinds that persist in Cordova application container. With many industry applications gaining momentum, the need for third party integrations like camera, barcode scanners and location are inevitable as they are helpful in some other way. After understanding these scenarios, I and my colleague have come out with various sample codes and executables which can help and guide developers in achieving the best they can achieve from browsers. To operationalize this we will be writing blog under different heading so as to make end-user more comfortable in reading the same. We also re-iterate that our focus would be only on the Fiori way of working(browser based). So let’s being our coding journey here: You can click on the individual link to get more details about the sample code. Please note this is a live document and we will be keep it updated on the new areas that we work on. Key features Code Sample for reference. Please feel free to comment on our topics, this will helps us to contribute more from our side. Added Signature and notification management.